Chappie Cans provide a low-calorie diet, enriched with vitamins and essential proteins and fats. The diets combine a hearty blend of key nutrients to support growth and development, enhance the physical condition of your dog and nourish and protect from the inside out. Available in a selection of nutritious and delicious varieties for the enjoyment of your dog. Chappie foods are wholesome and highly digestible for healthy internal systems and happy and healthy dogs. Fish and Fish Derivatives (Including min. 14% White Fish),Cereals (including min. 4% Rice),Meat and Animal Derivatives (Including min. 4% Chicken), Oils and Fats, Herbs & Minerals. Vitamin A: 500 IU/kg,Vitamin D³: 150 IU/kg,Vitamin E: 10 mg/kg,Total Copper as Copper Sulphate: 2mg/kg. With colourants. Vitamin levels guaranteed until best before date, (permitted EC additives). Protein 6 %, Crude Fibre 0.45%, Oils & Fats 5%, Crude Ash 1.5%, Moisture 74%. Fish and Fish Derivatives (including min. 14% White Fish),Cereals (min. 4%),Meat and Meat Derivatives (including min. 4% Chicken),Oils and Fats, Herbs & Minerals. Vitamin A: 500 IU/kg,Vitamin D³: 150 IU/kg,Vitamin E: 10 mg/kg,Total Copper as Copper Sulphate: 2mg/kg. With colourants (permitted EC additives). Protein 6 %, Crude Fibre 0.3%, Oils & Fats 5%, Crude Ash 1.5%, Moisture 74%. 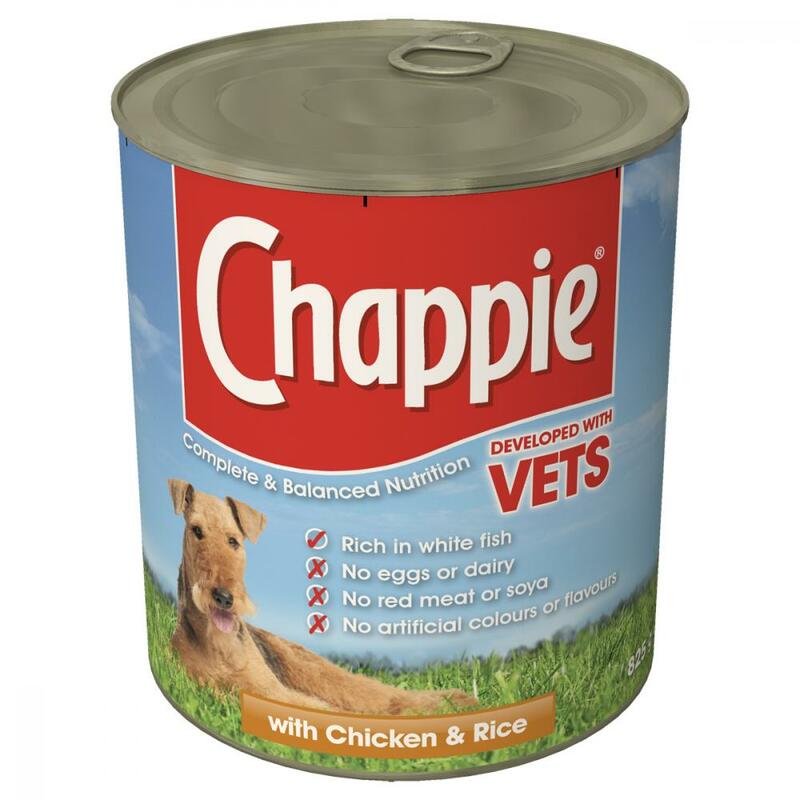 Below are some recent questions we've received regarding Chappie Wet Dog Food, including answers from our team. How many grams fat per tin compared to Hills z/d? Chappies 412g can has approx 3% fat content and the Hills z/d 370g has approx 12.6% fat content.